Does everything you would think burning anything too fast. Don't need to hold it on something but a few seconds and something will be happening...burning, lighting, Melting...etc. it's a laser that would compete with the best at any price but you won't find one anywhere but htpow...I see where the name comes from, Big Bang and real good, might get another so I have a spare....at this price you can get 5 for the cost anyone else has,...go for it! Excellent! 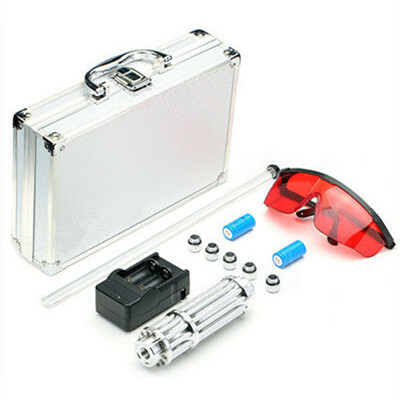 Best gift good laser with laser sword accessories. The power is good that be able to burn plastic or wood in black or dark color. if u want to use like a pointer the point is visible very far. Very satisfied! It is so powerful, burns every thing! Fast shipping, arrived on the fourth day. It will burn almost anything and is very visible in the brightest daylight. Shipping is really great, it arrived at me after 3 days when I order, and the laser is very powerful, I enjoy it a lot and happy to recommend it to everyone here. Very good price for such a powerful handheld laser, it burns black papers instantly. good product. Long range, powerful beam, and a rechargeable battery. I enjoy using it for all kinds of things. Totally worth the money. The multi tool is good too. Very good laser with accessories and great gifts LASER SWORD. The power is good It's able to burn plastic or wood in black or dark color. if u want to use like a pointer the point is visible very far. 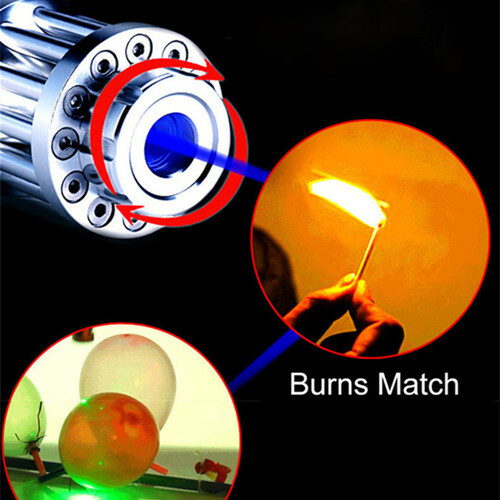 I was a little dubious about the claims of this laser being able to set stuff alight, however I was pleasantly surprised to find the claims were correct. Really good laser, comes in a great aluminium case with loads of attachments for dispersing the light into patterns. I would recommended this. Laser came in nice aluminum case with goggles, batteries, recharger, 5 starry laser caps, and great gift LIGHTSABER. The energy this laser provide is enomous, light matches within a second and burn your hand in that same time even in an unfocused beam! The beam, the spot or its reflection damage your eyes in milliseconds, so the goggles are not ment to exaggerate the power, suspectors shoud wear one too when looking at the performance of this laser. The quality and the shape of the housing is optimal, What I miss is a keylock to prevent unautorised use. The beam itself is not perfect round but who cares. To use it for astronomy, maybe someone in space will see it, it penetrates the atmosphere certainly when a collimator is applied. The lightspot is not very narrow but that makes this laser a little less dangerous. Very bright quality laser. Replacement for my wicked lasers Arctic that had failed. It was $299. And for less than $100 I got a much better laser. Great carrying case and accessories. I couldn't be happier. This is my first purchase from htpow and there will be many more. Good and powerful laser. Very nice look. Maybe should have second security switch. This one implemented is too easy to accidental turn on. Laser is not for children or idiots like earlier described. Ever use glasses! This unit comes in a nice case with a lot of accessories. I would definitely recommend to a friend. We will respond promptly and reliably to contact of initial malfunction Thank you very much for resending the item. I arrived safely and confirmed the operation. It was a good product without problems. I would like to enjoy shopping with confidence in the future so thank you. Light functions as described. No complaints save for the metal case --- the styro appears to be cut for another pointer... but that minor flaw is negligible. Overall still a good buy. This laser is fantastic, it shines in the sky and you can see is from miles away! It can burn everything that has a dark color! 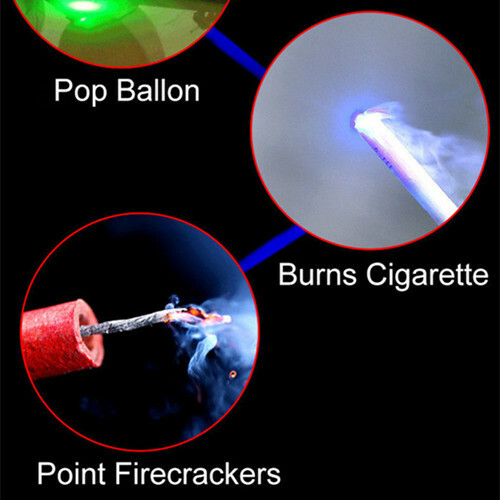 The high power burning blue beam laser pointer is powerful enough to light matches, burst balloons and burn through paper. Real powerful laser pointer. Exquisite packaging! High quality! This is my first purchase from htpow. In a word, I'm happy with the product and their service. My laser arrived yesterday. It's powerful enough for burning anything. Awesome! My first green laser. Took about 2 weeks to arrive from China. The beam itself isn't very steady, but I'm pretty happy with it. Perfect for casting pretty patterns onto the ceiling. Definitely a good buy considering the ridiculously low price. Incredible! EXTREMELY cheap for such a great laser. It can light matches, pop balloons, smoke leather slightly and all sorts. Just arrived today so I havn't got to test it at night yet. AMAZING! 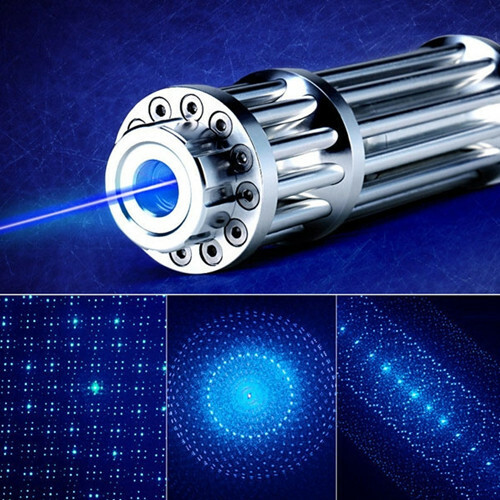 Good quality solid metal laser. Its very powerful and the beam is bright but I have not been able to get it to burn anything. When I adjust the focus ring, the beam just gets bigger so its not focusing at all. If you want a bright powerful laser for presentations, get this, if you want a burning laser, get something else. Me hubiera gustado ver a tiempo que este modelo no cuenta con bateria y que este modelo de bateria no es facil de encontrar en cualquier tienda, esto ha hecho que tenga que hacer otro pedido. Aun asi el laser es muy potente y tiene un tacto robusto y pesado. Arrived as described but took forever to get here...but made it through customs just fine. I saw the very first Star Wars movie and have been captivated ever since. Now I have seen the most recent SW movie. When I saw this advertisement to build your own Light Saber I knew I had to have one. It is fabulous. It is powerful. It is BRIGHT. Go ahead, your "Inner Child" knows you want one. You will be pleased. You can easily pop balloon, matches. It is robust and fancy. 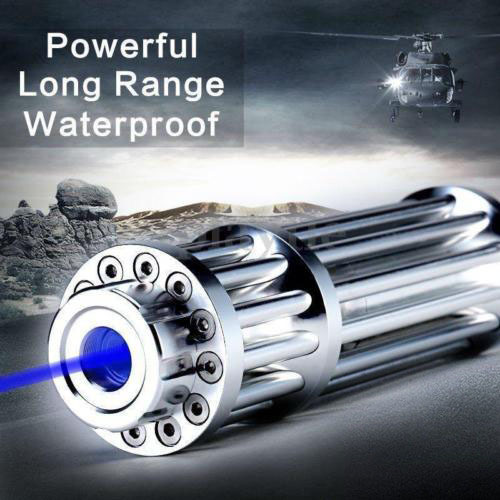 This is one amazing laser, actually burns just about any material even at good distance so be very careful with this device, use common sense. Goggles are a must and not sure if goggles come with the laser are sufficient. For the price, I can't think of any other laser comes close to it. Comes with a nice case. Highly recommend for any hobbyist need a powerful laser. Stress importance of handling with care and protect your eyes. We will respond promptly and reliably to contact of initial malfunction. Thank you very much for resending the item. I arrived safely and confirmed the operation. It was a good product without problems. I would like to enjoy shopping with confidence in the future so thank you. Light functions as described. No complaints save for the metal case --- the laser appears to be cut for another pointer... but that minor flaw is negligible. Overall still a good buy.